The seven mile long Mystic River has a long history of benefiting the communities surrounding this Massachusetts watershed. Native Americans fertilized their crops with fish caught from this river whose name (“muhs-uhtuq”) translates to “big river” in Wampanoag dialect. In the mid-1600s, European colonizers began building bridges and ports for easier travel to and from newly built towns sprouting up around the river’s banks. Over time, fishermen and shipyards flooded the area, expanding trade between Medford, MA and the West Indies. The Industrial Revolution had its hands in the Mystic River as well. Tide mills generated waterpower until the end of the 19th century producing saw wood, paints, and cloth. Industries such as mills, brickyards, and tanneries were scattered throughout the watershed and, in 1865, overfishing and pollution eliminated commercial fishing. However, citizens saw the potential of the Mystic River and wanted to make faster progress in bringing about beneficial recreational opportunities central to their neighborhoods. With MyRWA’s founding in 1972, the organization began to guide the types of improvement projects occurring in their community. They were soon able to channel investments and awareness to the mistreated waterway that often was given to the nearby Charles River in Boston. The efforts started in the late 1960’s have continued incrementally over the past 40 years in order to clean up this river. MyRWA’s work advocating for and supporting the health of the Mystic River is hard to quantify without data. Beginning in 2000, MyRWA has collected water quality data that helps the organization identify useful trends over time. Volunteers consistently collect water samples from 15 sites across the watershed for MyRWA’s Baseline Monitoring Program; staff test these for bacteria, nutrients, dissolved oxygen and more. The organization’s Hot-Spot Monitoring Program focuses on particular sub-watersheds, sampling whole stretches of tributaries or suspicious outfalls with the goal of identifying sources of sewage contamination, monitoring stormwater outfall pipes and comparing wet and dry weather data. Through its Cyanobacteria Monitoring Program, MyRWA also monitors for the blue-green algae that blooms in all types of water and negatively impacts aquatic life and public health. Staff analyze samples and post the information on an interactive map to warn residents of the associated risk. Through its water quality programs, MyRWA provides watershed residents and others opportunities to help improve the Mystic. Citizens can collect water samples and use MyRWA’s online tools to stay informed on which parts of the Mystic are safest for recreation. These programs also help MyRWA detect sources of pollution to be able to collaborate with local, state and federal officials to improve conditions and identify areas in need of restoration. Hosting technical trainings on green infrastructure for municipal staff in partnership with a local engineering firm. Conducting GIS analysis to identify target areas for green infrastructure projects. Developing stormwater educational materials for citizens, including utility bill inserts and handouts on pet waste and car and lawn care. 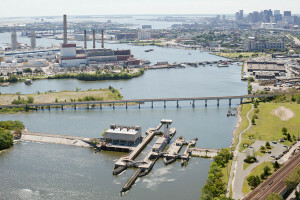 A Funded Mystic River Master Plan Brings Restoration Ever Closer! In 2009, the Mystic River Master Plan was developed by a state agency to restore river banks, protect wildlife habitats, and increase recreational use of the river and the surrounding land. Thanks in part to MyRWA’s advocacy, the state legislature approved a $250,000 investment and will soon begin executing the plan. Through the organization’s Clean Water Campaign & Policy Committees, a cadre of committed volunteers gives the river a voice by actively supporting responsible development that sustains clean water, the existing habitat, and a healthy environment. This initial funding for the Master Plan is a great success and required years of preparation, advocacy, and collective concern to achieve. Much work remains, but MyRWA continues to engage the community in water quality improvements and efforts to create bike and pedestrian pathways, parks, and greenways along various sections of the Mystic. The Mystic River Watershed Association’s multifaceted approach to improve the Mystic River watershed has proven to be a smart plan. Through the years, the Mystic River has endured its share of pollution; however, with the help of concerned citizens, the river can live up to the promise of becoming an outdoor haven for all. The Mystic River Watershed Association’s mission is to protect and restore the Mystic River, its tributaries and watershed lands for the benefit of present and future generations and to celebrate the value, importance and great beauty of these natural resources.